I realised as I was making this, that there are a couple of errors in the print and kindle editions currently, for which I apologise! I know I made it at least twice before publishing, so not quite sure how that happened. Here it is exactly as I made it today. I don’t often use Agave nectar, but it is quicker to use than making a sugar syrup and lower in calories too. 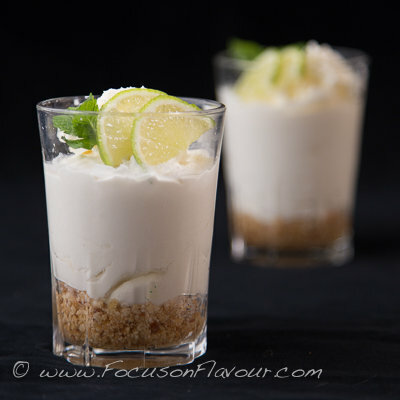 Enjoy the wonderful Cuban combination of lime, rum and mint in this simple uncooked cheesecake-like dessert. Melt the butter in a pan and then stir in the crumbled Amaretti, mixing well. Divide between 4 glasses, pressing down well and making the top even, then chill. Mix the lime juice, rum, chopped mint and agave nectar together and leave to infuse. Whisk the mascarpone and cream cheese together until smooth and thick. Strain the lime syrup and whisk into the cheese. Spoon over the biscuit bases and chill for at least an hour. To serve, top with slices of lime and mint leaves. You can use any kind of almond biscuits or a shortbread or digestive biscuit would also be fine. My calculations give 444 kcals per serving.